the same $3000 price point range." Let's get this out of the way right at the beginning. Both the Hack Attack and the Rawlings Pro Line 3 Wheel are excellent pitching machines. Either machine would likely wind up in most people's Top 5 list, so they are both great choices. That said, I must disclose a very important fact and one that some may say skews my objectivity in evaluating the pitching machines fairly. We do not sell any of the Sports Attack pitching machines. Read further and you'll hopefully see why we don't. We constantly evaluate our product line and whether or not to add other manufacturers' machines to our lineup. It is already confusing enough for customers, deciding between all of the pitching machines we have on our site, and unless another pitching machine brings something different or better to the table, we tend to decline manufacturers' invitations to add their products. As you can see, the stats on all of these machines are the same. They all throw pitches up to 100 MPH, they all have transport wheels and they all throw practically every pitch known to mankind - fastballs, changeups, side curves, 3/4 curves, sliders, sinkers, knuckleballs, screwballs, etc. At first glance, the only difference between them seems to be who the manufacturer is and the price. There definitely are differences between these three machines. Some are subtle and may not matter to you. Others are major and could definitely affect your decision about which 3 wheel pitching machine to buy. Both the Rawlings Pro Line 3 and the Spinball Wizard 3 Wheel pitching machine are made by the same company - Spinball Sports. They use a different type of "aerospace grade metal" which makes their machines about 30 pounds lighter than the Hack Attack. Not only does that mean that the lighter machines are a little bit easier to roll onto a field, but it also means that they can be shipped via FedEx. The Hack Attack is too heavy for any standard shipping carrier, so it has to be shipped via freight truck. Freight trucks do not traditionally even lower packages to the ground for you, let alone deliver them to your doorstep. At best, they drop the package at the curb and somebody absolutely must be present to sign for the package when delivered via freight truck. Freight companies also do not typically have the world's best tracking information and are usually a slower method of shipping. These things are minor compared to some of the other differences we point out, below; they may or may not be important considerations for you. The Rawlings/Spinball machines have a slightly better micro adjustment method for adjusting pitches inside/outside and high/low than the Hack Attack. The Spinball/Rawlings machines have a small knob on the left for rotating the head left/right and another small wheel on the right for adjusting pitches high/low. The Hack Attack employs a crank near the back of the machine to adjust the head left/right and another crank on the front side of the machine for adjusting pitches high/low. We think turning a wheel is a little easier than cranking a little metal gizmo and the positioning of the cranks on the Hack Attack are a bit awkward to get to but, again, not a massive difference. Do You Need A Combo Machine? Another consideration that may or may not make a difference is whether or not you plan to use the machine now, or in the future, with both baseballs and softballs. 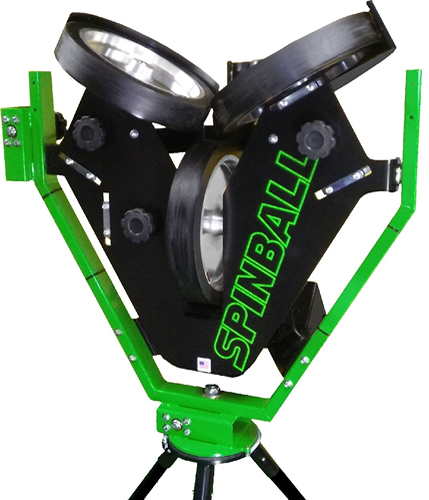 It costs $200 extra for the additional legs and chute needed to convert the Rawlings/Spinball machines into a machine that can throw both kinds of balls. The conversion kit for the Hack Attack costs $899. Paying nearly $700 more for a Hack Attack that can throw baseballs and softballs than you would pay for either the Rawlings or Spinball machine might very well be a deal breaker for many people! Do You Need An Automatic Ball Feeder? If you don't have someone always available to feed balls into the machine, one by one, you are not going to get a whole lot of batting practice in. An automatic ball feeder allows you to practice solo. They feed balls into the pitching machine every 6-10 seconds, depending on the feeder. If you are considering purchasing an automatic ball feeder with the pitching machine or sometime down the road, the ball feeders for the machines are definitely different. The Rawlings/Spinball automatic feeder holds 35 baseballs - more than twice as many as most automatic ball feeders. That means far fewer trips, collecting hit balls and resupplying the feeder before you can take your next round of cuts. The ball feeder for the Rawlings and Spinball machines is definitely more expensive than most other companies' feeders - it costs $699 but it also comes with a wireless remote control so that you can start and stop the feeder at will. The Hack Attack ball feeder is less expensive than the Rawlings/Spinball feeder. It only costs $549. That said, it DOES NOT come with a remote control. You can kick in another $299 for a wired remote control that comes with a 90 foot cord (yes, you read that correctly, it is not wireless like the Spinball/Rawlings remote control). If you don't want to fork over nearly another $300, you will likely miss 2-3 missed pitches while you sprint back to the batter's box after activating the feeder. Worse, it only holds 15 balls (2 or 3 of which you never got to swing at), so you'll spend nearly three times as much practice time gathering balls and putting them back into the feeder. Bottom Line: Very few people purchase automatic ball feeders without a remote control. If you compare apples to apples here, it costs $149 more for the Hack Attack ball feeder with a remote control - and it's not even wireless! I should mention that Sports Attack does make a "Team Feeder" that can hold 150 balls. It costs a hefty $1,799 without the remote, $2,098 with one. You could buy an extremely good pitching machine for what that costs! If money is no object, being able to hit that many balls before having to reload the feeder is definitely a plus (assuming you have no problem buying 150 balls at $45.00+ per dozen, too). 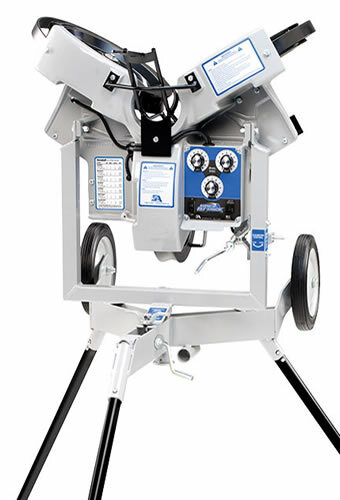 The Hack Attack is actually more similar to the Spinball Wizard 3 Wheel pitching machine than it is to the Rawlings Pro Line 3 wheel pitching machine. 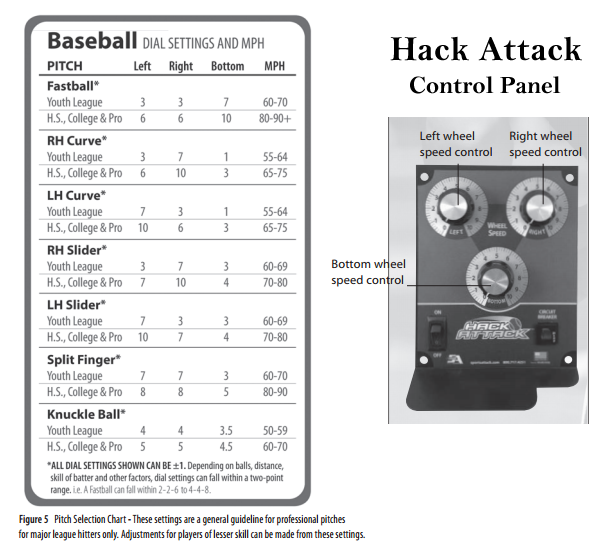 Both the Hack Attack and the Spinball Wizard 3 wheel pitching machine use potentiometers (knobs) to select pitches and speed whereas the Rawlings 3 wheel machine uses a digital push button pitch selection board. Many people do not care whether they are pushing buttons or turning knobs, so that shouldn't be a critically decisive factor. In fact, it's undoubtedly faster to turn a knob to the pitch type and speed than it is to cycle through up/down buttons. Anyone who has used an older style oven can tell you that pushing an "up temperature" button on the new style ovens 15 times to get from an oven's default 350° temperature to 425° is far more frustrating than simply turning the temperature knob on an old style oven to your desired temperature. In fact, if anything, the Spinball Wizard 3 Wheel gives you more control over spin than any of the three pitching machines, since there are far more degree of spin settings than the four that the Rawlings brand machine has. Some people are button pushers, and there's nothing wrong with that. We'll leave it for you to decide if buttons are worth paying extra for. The biggest difference in the machines, themselves, is the actual pitch selection. In the image, below, you will notice that the Hack Attack has a chart on the machine that tells you what positions to set the knobs at for various different pitches and speed ranges. Note that I used the word "ranges" and not actual, precise speeds. In fact, they note that these are "general guidelines" for use by major league hitters and that players of lesser skill will need to make their own adjustments. In other words, most people using these machines are going to need to just wing it and there is no way to dial in any sort of exact speed for any of the pitches it throws - at least as defined by anything you can read on the dials (the dials simply have single digit numbers on them). The Rawlings and Spinball 3 wheel machines do not have such a chart - you simply select the pitch type, the exact speed and amount of curve without having to look on a chart to see what wheels need to be adjusted to what speeds for various pitches. When you select a curveball with a moderate amount of curve and 75 miles per hour, that is what it pitches. This is the main reason the Rawlings/Spinball machines are so popular - you don't have to think at all and it pitches precisely what you select. 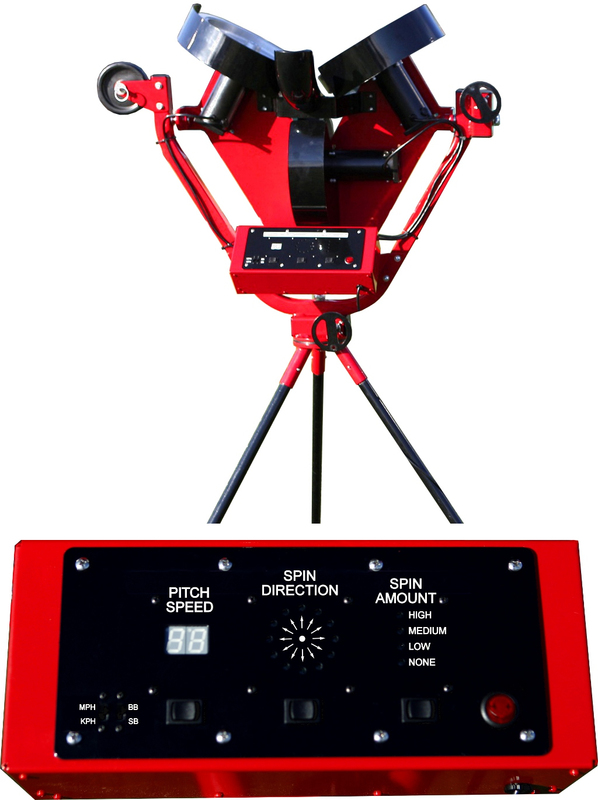 Below, you can see how selecting the exact pitch you want with either the Rawlings Pro Line 3 Wheel pitching machine or the Spinball Wizard 3 Wheel pitching machine is much more precise. The only difference is one uses knobs and the other uses buttons with a digital readout. Perhaps the most important consideration is the warranties. The Spinball/Rawlings machines have 5 year warranties on all parts (the wheels, themselves, have a 5 year pro-rated warranty but the entire rest of the machine has a full 5 year warranty). The Hack attack says it has a 5 year warranty but when you read the fine print, you will see that the wheels only have a 1 year warranty, the wheel motors only have a 1 year warranty and the electronic control board only has a 1 year warranty (in other words, just the metal parts and knobs seem to have a 5 year warranty). This is pretty cut and dried. If nothing stated, above, convinces you that there are differences in these pitching machines, they all have a different price. The Hack Attack is the most expensive at $3,299, followed by the Rawlings Pro Line 3 Wheel at $3,199 and the Spinball Wizard 3 Wheel being the least expensive at $2,699. 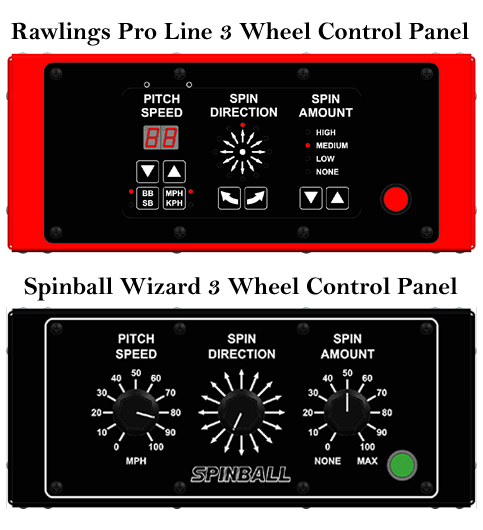 The ONLY difference between the Spinball machine and the Rawlings machine is the color and that one uses knobs and the other uses buttons for pitch selection. I think the choice is clear on which pitching machines are the best amongst the three and your only decision should be "buttons or knobs". No matter which 3 wheel pitching machine you decide to buy, you will be getting one of the top machines in the industry. Three wheel machines are a little more accurate than their two wheel counterparts, they make it easier for a batter to see the ball prior to it being delivered and, best of all, the third wheel makes it so that you never have to manually adjust the pitching machine head angle, like you do with all two wheel curveball pitching machines. When we compared the machines, we couldn't see any advantages to adding the Hack Attack to the website. It is definitely one of the top pitching machines made but we have two already that we think are better. When you also factor in the cost, we could see no reason why someone would pay more for a Hack Attack than either the Spinball or Rawlings 3 wheel pitching machines.